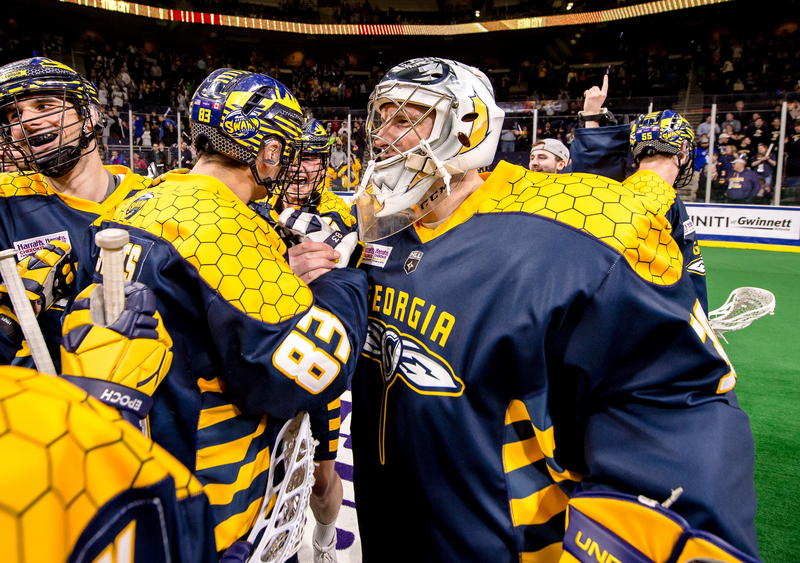 The Georgia Swarm defeated the Toronto Rock and took the season series in a dominating 14-5 home victory on Friday at Infinite Energy Center. Georgia got out to an early lead and never looked back in this one, dominating the Rock in what seemed like every facet of the game. While it was Georgia’s offense that got them rolling, their defense was equally if not more impressive in the win. Goalie Mike Poulin had a career day and everyone out in front of him made an impact as well. The Swarm played a complete game on both ends of the floor and that’s what won them this game. “That was the best team game we’ve played in a long time, and it’s the right time of year, so hopefully we can keep that up and I can continue to reap the benefits,” Poulin said in a Swarm press release. Georgia got the party started right out of the gate with Jordan MacIntosh scoring nine seconds into the game. Just 35 seconds later Kieran McArdle got Toronto on the board to make it 1-1. After McArdle’s goal it was all Georgia for the rest of the first and for the most part, the rest of the game, as the Swarm went on a four-goal run to take a 5-1 lead heading into the second. Shayne Jackson scored on a ridiculous low angle shot to extend the Georgia run and push the lead out to 6-1 early in the second. The bleeding finally stopped for Toronto as Challen Rogers scored a transition goal to get the Rock some momentum. With Toronto finally finding some success the half ended with a lot of back-and-forth play. Despite the Rock’s efforts late in the second, Georgia went into the locker room with an 8-4 lead. The Swarm would be able to grow that lead even more in the third as they stepped up big time on both ends of the floor. Randy Staats got the second half scoring started early on, pushing Georgia out to a 9-4 lead. From there on out the Swarm were buzzing on both ends of the floor. Georgia used a five-goal run to take a 13-4 lead before Toronto scored again. “Us getting through the middle, setting hard picks, getting off the floor, shutting down their transition offensively, and moving the ball and finding the open guys, I think those were our big keys for tonight, and we executed on our open shots,” stated Staats in a Swarm press release. Brandon Slade scored the last goal of the game for Toronto late in the third to finally get them their five points. Georgia scored just once in the fourth to secure the 14-5 win and both defenses prevailed throughout the fourth quarter with just on goal scored. The Rock were led by Tom Schreiberand Brad Kri who each had two assists. The Rock saw five different goal scorers in McArdle, Rogers, Slade, Rob Hellyer and Johnny Powless. Creighton Reid led the Rock’s defense with four caused turnovers while also chasing down six loose balls. Georgia was led by Randy Staats who tallied 10 points (5G/5A) in the win. Shayne Jackson also had five points (3G/2A) and Lyle Thompson put up nine (1G/7A). Alex Crepinsek scooped up eight loose balls and caused one turnover to lead the Swarm defense. Nick Rose and Riley Hutchcraft split time in the Rock net. Rose made 21 saves on 32 shots and Hutchcraft made 13 saves on 16 shots on goal. Mike Poulin made 47 saves for Georgia, while also setting personal bests with a .904 save percentage and 5.00 goals against average. Georgia will have a bye week next week before taking on San Diego at home on April 5th. Toronto will play on Saturday at Buffalo and will be at home against Philadelphia on March 30th.